Siddhartha Gautama, who founded Buddhism, was born in the ancient kingdom of Nepal. Lord Buddha was born in Lumbini, Nepal. Emperor Ashoka of India had established a pillar in Lumbini, the birthplace of Lord Buddha. Gradually, Buddhism became a dominant religion in sparsely populated northern areas of the country. The first Licchavi king, Amsuvarma, married his daughter Bhrikuti to the ruler of Tibet, King Songtsen Gampo. According to legend, she received the begging bowl of the Buddha as part of her wedding dowry. It is believed that she introduced Buddhism into Tibet. Fine Buddhist art was also developed in Nepal. Ethnic groups residing in Central Nepal are mostly the followers of Buddhism and include Magar, Bhote and Gurung people. It is believed that Buddhism in Nepal has also been influenced by Hinduism as well. The Licchavi period saw both Hinduism and Buddhism flourishing in Nepal. Excellent examples of Buddhist art of the period are the half-sunken Buddha in Pashupatinath, the sleeping Vishnu in Budhanilkantha, and the statue of Buddha and the various representations of Vishnu in Changu Narayan. Tourism is another important factor for promoting Nepali Buddhism to the world. Every year, Kathmandu receives more than 10,000 travelers from all over the world just to visit the Boudhanath and the Swayambhunath stupas. These are remarkable and significant architectural sites in Kathmandu. Apart from these two main Buddhist monuments, there are hundreds of Buddhist monuments in every corner of the streets of Kathmandu and in other cities in Nepal. Boudhanath Monastery, Nepal’s largest monastery, is located east of Kathmandu. It is one of the most important pilgrimage sites in the world. 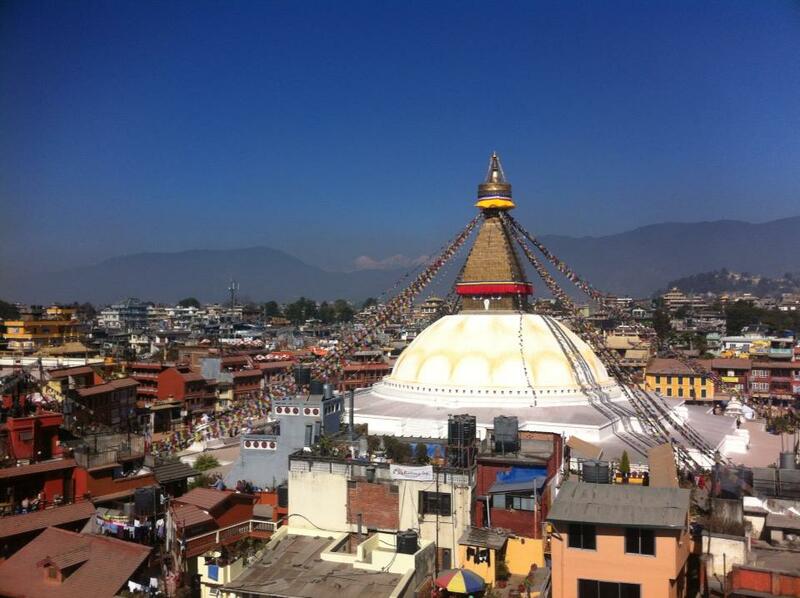 Boudhanath Stupa is one of Nepal’s most holy sites for the Buddhist faith. This stupa, a well-known Buddhist pilgrimage site, is included in World Heritage Cultural site list by UNESCO. After the Chinese invasion in 1959, Tibetans in thousands came to this famous Buddhist Chaitya and energized the Stupa. Swayambhunath Monastery is a legendary Buddhist shrine that sits on a hilltop of Kathmandu valley. It is regarded as one of the oldest Monasteries in the world. 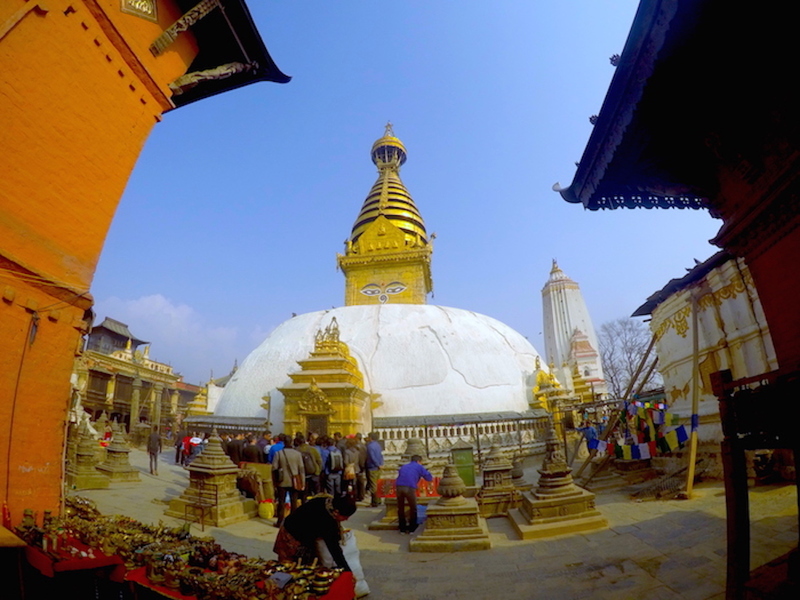 The word Swayambhunath means “the self-existent” in English. The temple is also known as the monkey temple as large tribes of monkeys can be seen there regularly. 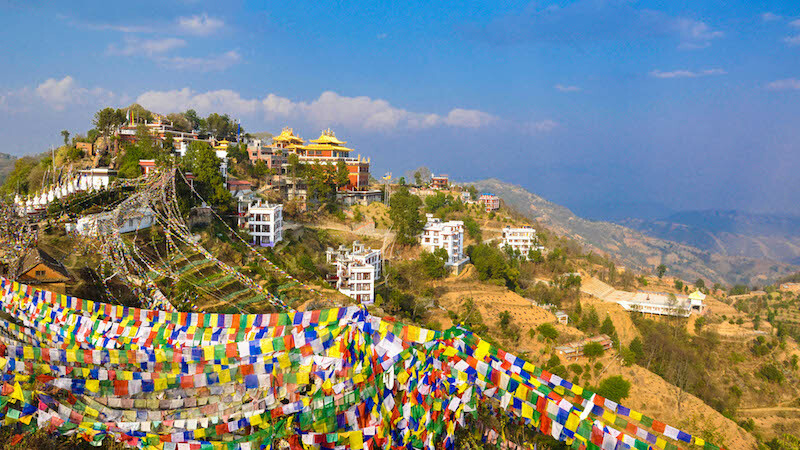 Swayambhunath Monastery is complete with Buddha eyes looking out across the valley, an iconic symbol. Kopan is a Tibetan Buddhist monastery situated on the hill behind the Bouddhanath Stupa. 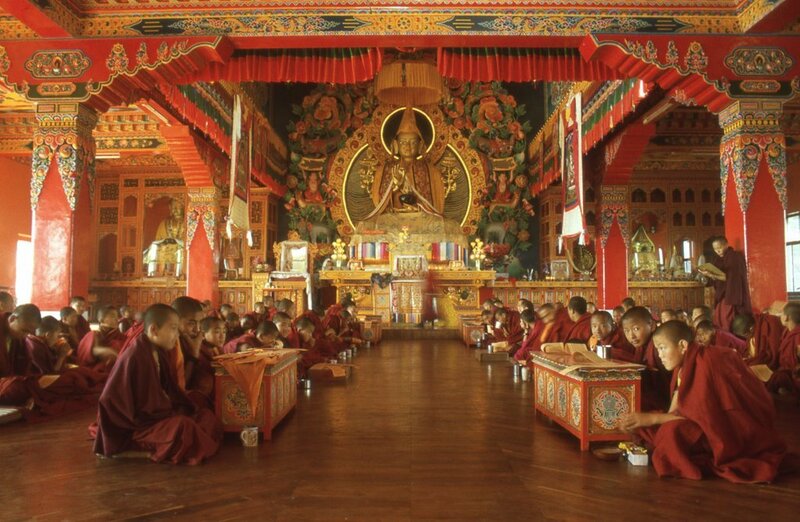 Located at the top of Kopan Hill, the monastery is home to over 300 Tibetan Buddhist monks. Dominated by a magnificent Bodhi tree, it was once the home of the astrologer to the King of Nepal. The Kopan Monastery also offers a panoramic view of the town of Boudha below and the spectacular Himalayan mountain range. Namo Buddha lies 38 km east of Kathmandu. Namo Buddha is one of the most important pilgrim sites in the valley, particularly for Tibetan Buddhists. In one of his previous lives as a prince, it was here that the Buddha gave up his body out of compassion for a starving tigress and her cubs. It has an amazing story concerned with the Buddha which is commemorated by an ancient stone slab and a Stupa with the all-seeing eyes of Lord Buddha. Namo Buddha temple is designed by Thrangu Rinpoche as a representation of the three yanas or paths. Lumbini, the birthplace of Lord Buddha, is one of the most popular pilgrimage places in the world. 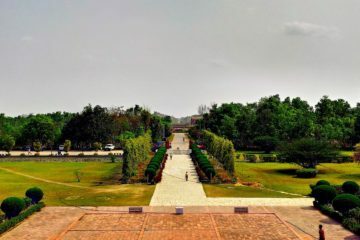 Lumbini is now a UNESCO World Heritage Site. It is one of the four major Buddhist holy places commemorating the most significant events in the Buddha’s life. One of the most attractive parts of Lumbini is the temple of Maya Devi. This temple, dedicated to the mother of Lord Buddha – Maya Devi – was excavated a few years ago. The main attraction of Lumbini remains the Sacred Maya Devi temple, the Ashoka Pillar, the sacred pond and the China Temple. 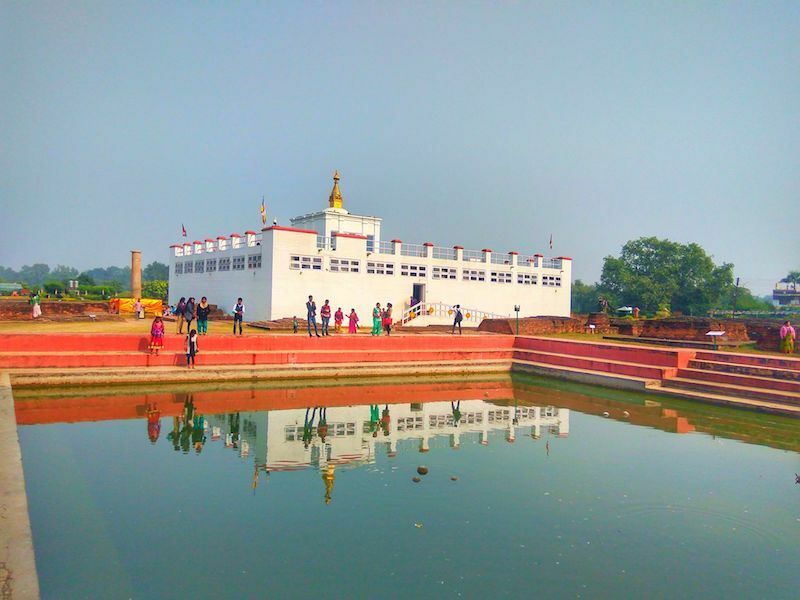 The shrines and monasteries built by different countries and in different times reflect the architectural traditions of the respective countries and thus giving Lumbini an international feel with a message of universal friendship and brotherhood. 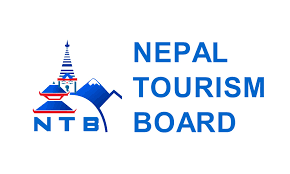 For more details about the entry fees, please refer to UNESCO World Heritage sites of Nepal. 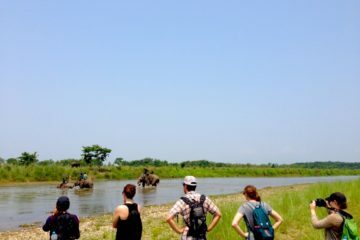 For the organized trip, please take a look at our 8 days Buddhist Pilgrimage Tour. or 5 days Kathmandu Panorama Tour.